Having an old tree stump in your yard can really ruin your lawn/garden area; the tree specialists at Lola’s Landscape will grind or remove these stumps from you yard. We typically grind stumps 4″- 6″ below grade. 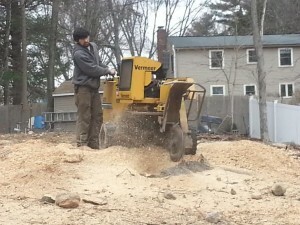 We can also completely remove the stump for an additional cost; depending on how big the stump is, it might be a smart idea to have it completely removed. Having stumps in your yard aren’t only hideous looking, but they also pose as safety hazard if they aren’t removed properly. We will properly remove and grind stumps from your yard, which will only help enhance the beauty of your lawn or garden. We don’t recommend doing it yourself, or hiring an amateur because that leaves the door open to costly and unattractive mistakes. For a free estimate, or to schedule an appointment for our stump grinding services, please give Lola’s Landscape a call at 774-248-4584.